The Fleece Inn01535 642172work Public HouseOriginally a coaching house, the Fleece is conveniently situated on the Main Street at the very heart of the village. Excellent bar food is served both at lunchtime and in the evening. If you prefer to eat a little more formally there is a two tier dining area. The Fleece has recently been awarded the prestigious Beautiful Beer Platinum Award for the high quality of its cask ale. Licensed, vegetarian options, children welcome during the day. 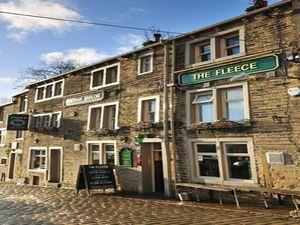 Originally a coaching house, the Fleece is conveniently situated on the Main Street at the very heart of the village. Food served: Monday - Friday 12.00 - 15.00 and 17.00 - 21.00.